Meigs senior Marissa Noble (8) leaps for a spike attempt during Tuesday night’s TVC Ohio volleyball contest against Vinton County at Larry R. Morrison Gymnasium in Rocksprings, Ohio. ROCKSPRINGS, Ohio — The Lady Marauders werethisclose to turning their celebration into one heck of a memorable party. 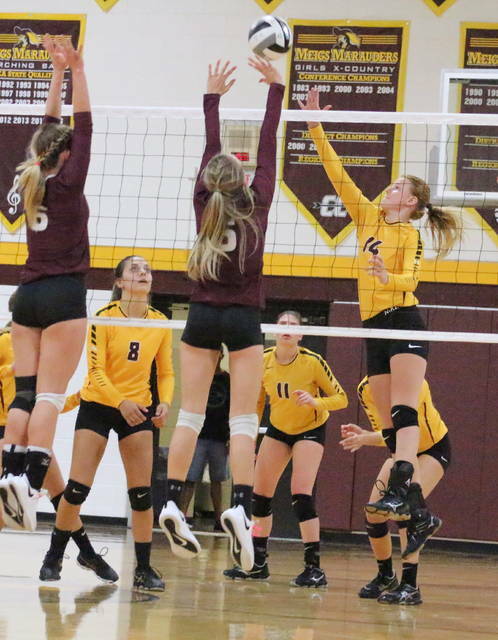 The Meigs volleyball team had some real opportunities to pull off a shocker on Senior Night, but visiting Vinton County ultimately survived a five-game thriller on Tuesday night with a 23-25, 29-27, 25-10, 21-25, 15-4 decision in a Tri-Valley Conference Ohio Division contest at Larry R. Morrison Gymnasium. The Lady Marauders (4-15, 1-10 TVC Ohio) battled through 18 ties and 14 lead changes in their second matchup with the Lady Vikings, but the hosts showed an early enthusiastic spirit after honoring seniors Madison Fields, Marissa Noble, Chloe White and Savannah Zeigler before the start. MHS built a 19-12 in Game 1 in setting the tone, but VCHS (14-7, 7-4) rallied with 10 of the next 13 points to knot things up at 22-all. 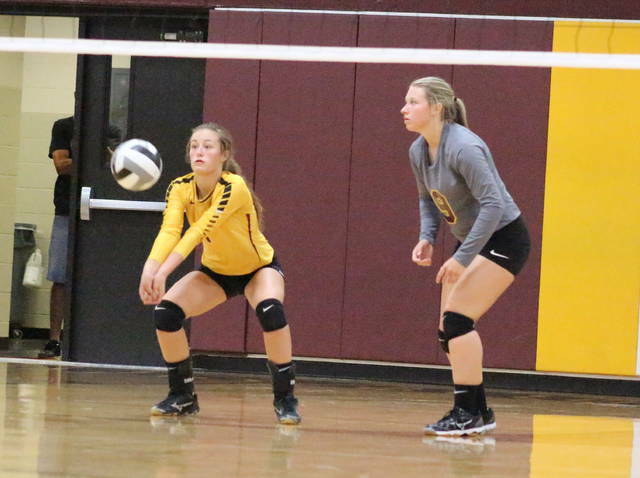 Meigs, however, reeled off two straight points before trading the next two points, giving the Maroon and Gold a three-point win and a 1-0 match advantage. Game 2 proved to be the most dramatic as it featured 12 ties and seven lead changed alone. Meigs broke away from a 19-all tie with five of the next seven points for a 24-21 advantage, but the Lady Vikings shook off four game points while reaching a 27-all tie. The Maroon and Gray ended up scoring the final two points to secure the minimal win at 29-27, allowing the match to move to a one-all tie. Riding momentum, Vinton County never trailed in Game 3 and secured their largest lead of the entire match with the 15-point outcome — giving the guests a 2-1 match edge. 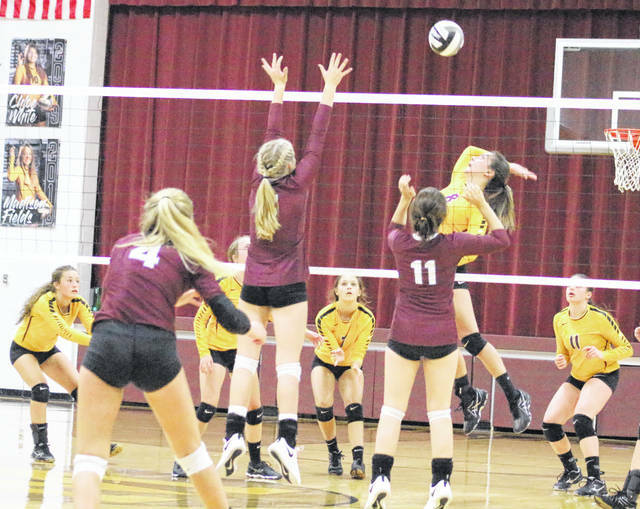 Meigs countered by never trailing in Game 4 and building its largest lead of the night at 19-11 before rolling to a four-point win that forced a pivotal fifth game. In that finale, VCHS never trailed and had Josie Hembree serve out the final nine points that turned a 6-4 lead into a 3-2 match triumph. The Lady Vikings also claimed a season sweep of Meigs after posting a 25-18, 25-23, 25-18 decision in McArthur back on Sept. 13. Though the final outcome was a tough one to accept, MHS coach Lea Ann King still wanted to acknowledge her seniors and their efforts — not only for their night … but also for their careers. Fields led the Meigs service attack with 11 points, followed by Mallory Hawley with eight points and Noble with seven points. Baylee Tracy and Breanna Zirkle were next with six points apiece, while Kylee Mitch added five points. Maci Hood also had one service point in the setback. Noble led the net attack with nine kills, with Hawley and Hood respectively chipping in seven and six kills. Hannah Durst added two kills and a team-high three blocks, while Fields also recorded a kill. Hawley and Noble also added two blocks and one block, respectively. Hembree led the Lady Vikings with 17 service points, followed by Lucy Ward and Lacy Stapleton with 15 points apiece. Maylea Huff was next with 13 points, while Cameron Zinn and Kerrigan Ward respectively added five and three points. Sydney Smith led the Vinton County net attack with 13 kills, followed by Huff with 10 kills. Hembree and Zinn were next with seven kills each, while Stapleton and Lucy Ward chipped in six kills and two kills. Meigs completes its TVC Ohio regular season schedule on Thursday when it travels to Wellston.